Corporations are the biggest winners in the tax reform package Congress proposed last week. The ability to deduct 100% of the costs of new equipment. A special rate of 12% on money they bring back to the United States from low-tax countries instead of the 35% rate they face now. Eliminating taxes on income made on profits anywhere in the world, as the law focuses only on profits from U.S. operations. This all sounds good for earnings on paper. But, as the chart below shows, corporations aren’t paying the top rate. Over the last 12 months, companies in the S&P 500 paid only 22% of their income in state and federal income taxes. 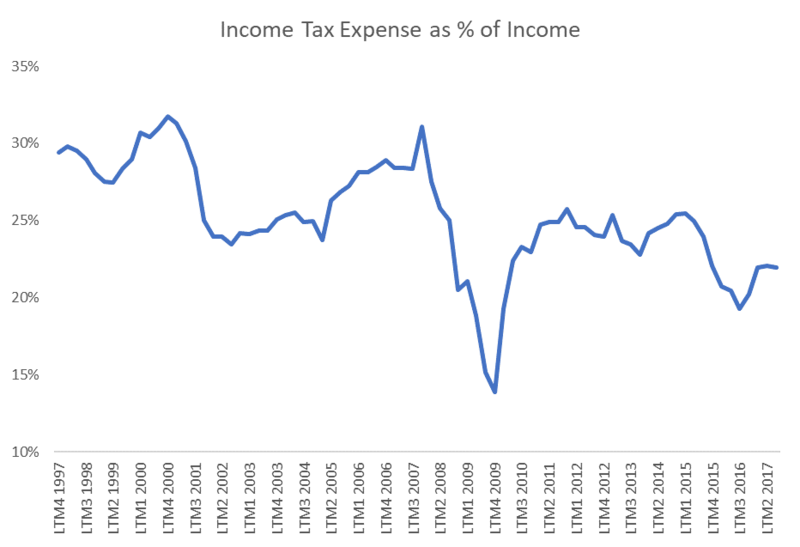 Over the past 20 years, the average tax bill has been 25.2%. The truth seems to be that corporations will use any tax reduction strategies available to them. Cutting the top rate will lead to lower tax bills. But the amount is going to be less than expected. Even though tax reform proponents claim they’re cutting loopholes, they’ll still be there. There are billions of dollars at stake. S&P 500 companies paid over $36 billion in income taxes in the past 12 months. Even though tax reform won’t boost profits much, it’s bullish for stocks. Allowing companies to bring cash back at a low rate will boost share buybacks. That gives earnings a one-time boost. In the long run, tax reform will matter. Companies will use the ability to immediately expense equipment to zero out taxes some years. But accountants will still depreciate equipment to even out earnings. The bottom line is tax reform will boost the accounting gimmicks companies use. It will also lower federal tax receipts. But it’s not going to help investors very much in the long run.